There are many golf courses in the Malaga area of Spain’s Costa del Sol, but there is no doubt that Las Brisas is one of the best and it’s also one of the eldest. It’s a 1968 RTJ masterpiece and Robert Trent Jones was obviously freshly inspired having just completed Sotogrande. His creation at Las Brisas is just as good, especially following its facelift in 2014 by former Robert Trent Jones Jr. associate, Kyle Phillips. 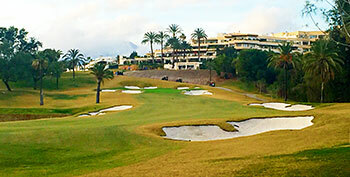 Las Brisas was one of the first courses in Europe to use bent grass and the brave decision was quickly rewarded by being chosen as the host venue of the 1973 World Cup of Golf, which saw the USA (Jack Nicklaus and Johnny Miller) as the winners just ahead of South Africa (Gary Player and Hugh Baiocchi). More recently in 1987, England’s Nick Faldo won the Spanish Open here at Las Brisas. Perfectly maintained, Las Brisas oozes quality from beginning to end. With strategically placed bunkers, plenty of water hazards and tricky raised green sites, Las Brisas is as much about position, both off the tee and with approach shots, as it is about length. The course opens up with a cracking series of holes and many on the back nine sweep left and right to through stands of trees. You cannot help but enjoy Las Brisas and if you manage your way successfully through the many risk and reward decisions, you might even card a good score. Las Brisas was the final course on our short three day trip and had recently undergone a significant redesign under Kyle Phillips. The course set on a narrow piece of land uses the undulations and elevations really well. From the tee Las Brisas is not overly daunting and the new bunkering stands out with its white sand framing the fairways. I thoroughly enjoyed the challenge around the greens with run off areas, bunkers and rough giving the player a number of short game options. There are some great holes on Las Brisas from the 8th a par 5 with a steep barranca running down the right followed by water protecting the narrow green...this is a cracking risk and reward hole. The 11th a long par 3 with its small green again protected by water is another brilliant hole. The front 9 maybe the best in the area with its undulation changes and variety of holes and although the back 9 is good it does not quite reach the heights of the front side. All in all Las Brisas is a fine course in excellent condition which provides a fun test for players of all abilities. It was a privilege to attend the European Institute of Golf Course Architects annual conference last week in Puerto Banus to hear architect Kyle Phillips and General Manager Paul Munoz Langley talk at length about the recent renovation work carried out on the Las Brisas course. The vote to approve the upgrade of the front nine holes only went through on a narrow majority but once the membership could see what had been achieved, they very quickly moved to have the back nine improved with the installation of new irrigation and drainage. The green on the 9th has been pulled back to allow the construction of a popular half way house that now overlooks the 9th and 18th greens beneath the clubhouse. A waterfall was created at the 12th hole to help regulate the flow of water through the course and two trees were transplanted on the 15th - at a cost of 150,000 euros! I played the course the day after I’d been to Sotogrande, another old RTJ track further along the coast, enabling me to make a direct comparison between the two layouts. I enjoyed the other course (even though it’s very demanding for the ordinary golfer) but I really liked Las Brisas; it’s bunkering in particular is superb, with impeccably proportioned fairway and greenside sand hazards beautifully framing the holes. Right from the off, at the downhill par four 1st (pictured above), you can gauge the sort of challenge you’ll have for the rest of the round with a green perched by the small lake and three bunkers on the bail out right hand side to catch more timid golfers who try to avoid taking on the watery approach. I wasn’t so keen on the back nine because it’s laid out on flatter terrain, allowing water to prevail on many of these holes, though the par five 12th is a very fine example of how best to use an aquatic feature to make a hole strategically challenging. Because conditioning has been improved so dramatically on the back nine, the front nine is now being revisited to further upgrade those holes, with 5, 6 and 8 next in line for this work. Once the renovation is completed, Las Brisas will surely be a match for any course in the Marbella area and beyond. Heavy rainstorm destroyed part of the golf course just before I played it.The front nine holes were still ok but the rest of the course was "GUR". Bad luck that did not alter my appreciation of the thrilling first nine holes! A great start with 4 magnificent holes that require the best shots if you want a decent score. Especially hole 2 par 4 with its 394m uphill second shot: it requires a super drive with fade if you want to achieve GIR. Hole 8, a par 5, starts with an inviting large fairway... to end on a narrow green just across a small streamlet requiring an ultra-precise approach shot. Club house restaurant with magnificent terrace and menu card. Can't wait to play the full 18 holes. The pride among the membership and club officers for their iconic layout has been fuelled by the work of Kyle Phillips over the past 2 years. In 2014, Kyle focused on refining the front nine which was closed for a year where tee boxes and bunkers were improved among other alterations. In October 2015, the back nine was completed however it resulted in an entire new nine holes - with significant changes to the climatic last three holes where Kyle changed the routing and introduced majestic architecture. The entire course is getting Bermuda grass seed, all of the back nine is done and all but three of the holes on the front are complete. The course doesn’t take long to show its teeth with the tremendously difficult 2nd hole which is a dog-leg right moving sharply uphill to the perched green-site. Hitting this green in regulation is a feat in itself. The front nine routing does not offer much change in direction with holes 3, 4 and 5 heading out and 6, 7 and 8 turning around and coming back in. This is not to be viewed as a negative though – far from it actually! While it’s a compact piece o f land, golfers will be constantly challenged by the fabulous change in elevation. The uphill par 3 4th is long and tough, whereas the rolling par 5 5th hole will give you a chance to get back any dropped shots on the devilish opening stretch. The views across the rolling land raised the hairs on the back of my neck as I celebrated the fact that RTJ developed a golf course on this wonderful topology. The back nine continues the ‘out and back’ nature of the routing as 10 through 13 take you to the end of the property before you stand on the 14th tee and head back towards the house. As part of the Kyle Phillips renovation on the back nine included clearing trees and implementing his signature bunkering style. His personal touch with bunkering is the closest I’ve seen the bunkers created by Alister MacKenzie at iconic venues like Crystal Downs, Cal Club of San Francisco (also a Kyle Phillips restoration) and Valley Club of Montecito. If Pasatiempo in California had a Spanish cousin, its name would be Real Club de Golf Las Brisas! While playing the short par 4 13th hole, players now face a newly created large menacing bunker creeping up the left side hugging the dog-leg and catching those who bite off more than they can chew. It’s a fabulous example of a short hole requiring strategy rather than power. The par 5 15th climbs up to the crest of the property before you embark on the new final stretch. The downhill par 3 16th over the pond is an all-world one shotter, which gets the juices flowing before the par 4 17th Index 1 with a carry over a hazard off the tee to the raised fairway and well protected green! Making par on each of the final holes before reaching the clubhouse is a wonderful way to finish on this fabulous layout. Once the world sees this renovated Kyle Phillips design, Real Club de Golf Las Brisas will be at the tip of everybody’s tongue when discussing the best courses in Spain. Best course in the "Golf Valley"
I've been a member of Brisas for 20 years, play it 3 or 4 time a week during the season - and never tire of it. My favourite course.